CD review: "Blues + Jazz"
This review first appeared in the July 1, 1994 issue of the North County Blade-Citizen (now North County Times). 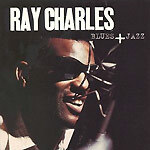 This two-CD collection showcases Ray Charles' immersion in blues and jazz early in his career. Disc 1 is dedicated to the blues recordings, and Disc 2 to the jazz sides. The blues cuts show Charles' growth from being almost a clone of singer Charles Brown to the development of his signature sound on blues tunes like "Night Time Is the Right Time" (1958). The jazz material features Charles in a variety of settings, surrounded by jazz luminaries that include Milt Jackson, with Quincy Jones arranging. Charles shows a remarkable feel for jazz on these cuts, with an uncanny knack for wringing every nuance out of a piano solo. What this set really shows is that Charles has an incredible ear for the serious side of American music, even if he has devoted himself to pop in the years since these tracks were laid down.